There are those among us that have proven to be so special that they have been placed in a catagory all of their own. These special people are the movers and shakers for our Boston Terriers. They have influenced our breed like no others and continue to be the breed's finest promotor's. These special people are the BTCA's Living Legends. Mr. Leonard Myers has been involved with Boston Terriers for practically his entire life. He registered his first litter as a breeder in 1936 and has been an AKC Judge of the breed since 1960. His judging assignments have taken him from California to to Massachusetts, from Florida to Minnesota, and all points in between. He has judged a number of these shows at least four times. Always an avid student of the breed, he was fortunate to have as mentors, the most knowledgeable breeders and the best judges of Boston Terriers the breed has ever known. Leonard was able to draw tremendous experience and insight from individuals who were involved during the first decade of the 1900’s, when the breed was still in its infancy. These individuals include Mr. Harry Clasen, Mrs. W. E. Porter, Mrs. Singe Carlson and Mr. Emory Wheeler. His dogs have won Best of Breed at many Specialties, Group I’s at all breed shows and All Breed Best In Show from the Bred By Class. 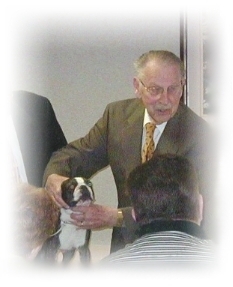 Leonard was the breed columnist for the AKC Gazette and wrote many articles for Dog World and Boston Terrier magazines. He has served as Officer, Board Member, and Show Chairman for several clubs. 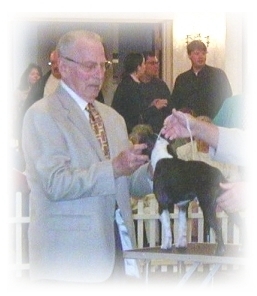 Mr. Myers has been honored with invitations to judge five Boston Terrier Club of America National Specialties, a significant achievement, unequalled in our breed history. The milestones are many including being the judge for the Boston Terrier Club of America Centennial in 1991 and the Western Boston Terrier Club Centennial in Chicago in 2002. His enthusiasm and love for the breed is as strong today as it was when the first Boston entered his life. He is both humble and proud of his contributions to the breed and his association with the most astute breeders of the last century. 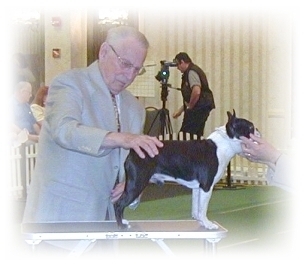 Judging the 2003 Boston Terrier Club of America’s National Specialty marked Mr. Myers’ last appearance as a judge in the breed ring. Thank you Mr. Meyers for your years of undying devotion to our breed. Your influence in our breed will be felt for generations to come.